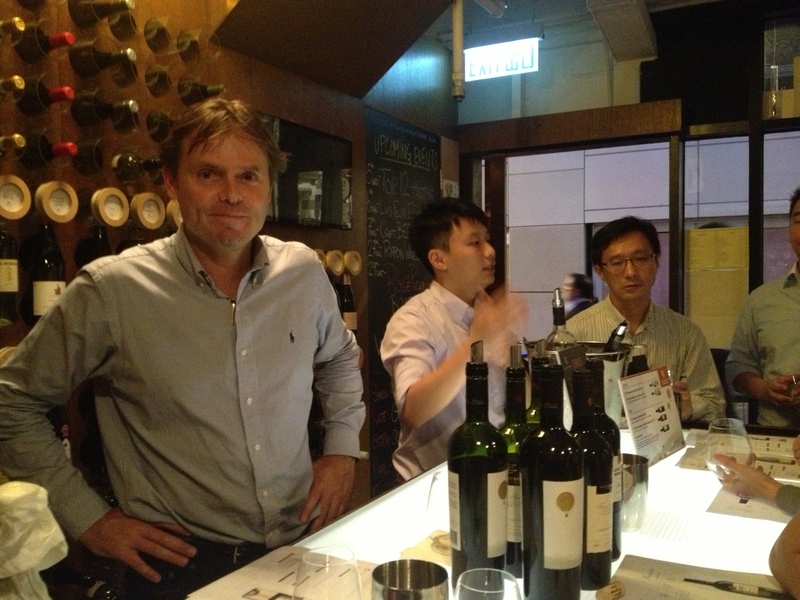 Last night I attended a tasting at The Flying Winemaker of Luis Felipe Edwards Wines of Chile. Before attending I did a spot of reading and if you read enough about wine from Chile a couple of themes begin to emerge; it is phylloxera free, wine making regions are being extended to the geographical limits of this long and narrow country, there is a wealth of technology and knowledge being applied to wine making in Chile and the signature grape of Chile is likely to be, if it is not already, Carmenere. Phylloxera, an aphid capable of devastating entire vineyards, was brought to Europe inadvertently via some plant cuttings from the Kew Gardens in England that had originated in North America. The result was the devastation of 70% of vineyards across Europe by the end of the 19th century until it was discovered that rootstocks of American grape vines were resistant to this aphid. American rootstocks are of a different species of the grape genus commonly used to grow grapes for wine making and those rootstocks are able to heal the wounds caused by Phylloxera and prevent further damage, thus surviving. So it is today that many of the grape vines for winemaking are a combination of the genus for winemaking grafted on to American rootstock to ensure resistance to phylloxera. Notable exceptions are Chile and parts of Australia where this pest has yet to make an appearance. For a quick overview on Phylloxera take a look at Wine Folly. Being relatively new to the wine producing community Chile has embraced all that is on offer – the latest technological advances, sharing of knowledge and ideas from visiting winemakers, travelling abroad to study as well as investment from high profile members of the wine world (e.g. Lafite-Rothschild’s investment in the Paralillo estate of Los Vacos ). Luis Felipe Edwards (LFE) wines are a good example of this. Not only has significant investment been made to upgrade the winery with a temperature-controlled building including “state of the art” machinery but the Chief Winemaker at LFE is a graduate from Roseworthy, University of Adelaide and has worked with Robert Mondavi in Napa. The grape most commonly associated with Chile is Carmenere and I love the history of this grape. Being an addict of detective shows it perhaps is no surprise I enjoy reading about the discoveries being made in grape “forensics”, if you will. In my post on Jamsheed Wines I mentioned the DNA testing, which confirmed Shiraz originated in the South of France and not Persia as originally thought and, much to my delight, we have a similarly intriguing story in Chile. The Carmenere we tasted from LFE Wines was from the 2011 vintage and presented a nose of spice, earth and black fruits. As a late ripening grape Carmenere can sometimes suffer from overly herbaceous or stalky flavours if it is not left on the vine to ripen sufficiently. The LFE Reserva Carmenere certainly did not suffer from this issue – flavours of black plums, cherries and blackcurrant were followed through with some spice and a hint of blackberry candy, perhaps owing to the subtle use of American oak. Prior to the Camenere the other wine that caught my attention was the beautifully balanced Gran Reserva Chardonnay 2012. The words “delicious”, “well balanced” and “very nice” seem to appear more than once in my notes on this wine. A delicate nose of fresh citrus notes with a hint of butter and toffee. That richness is continued on the palate with texture imparted from maturing the wine in oak and flavours of lemon curd and burnt butter leading to a good finish of zingy fresh citrus. 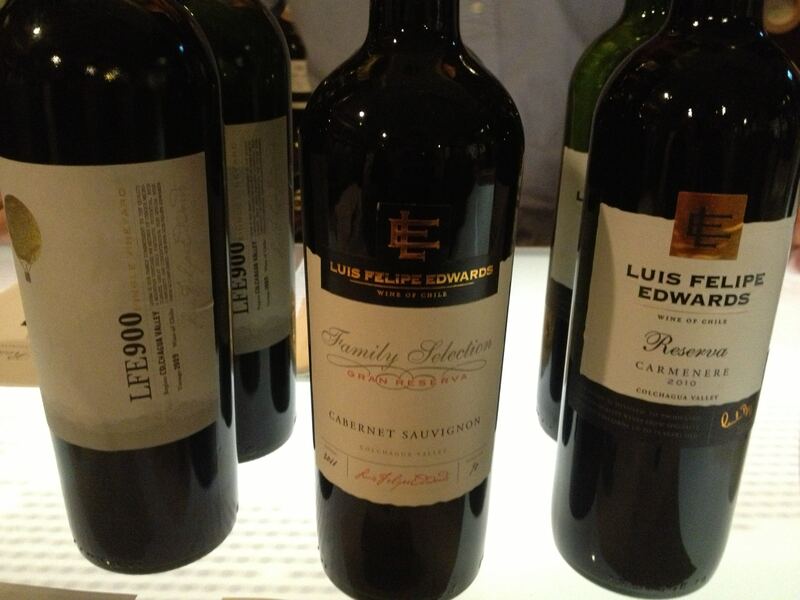 Also on tasting was the LFE900, a blend of Syrah, Petite Syrah, Cabernet Sauvignon, Mourvedre, Petit Verdot and Malbec, so named for the 900m above sea level at which the vines are planted – some of the highest in Chile. This vineyard in the Colchagua Valley is a testament to sheer drive and determination in seeking out the best possible sites for growing vines. Originally an arid mountaintop this area has been transformed into a series of vineyards planted with 10 grape varieties. The wine produced from this project shows red and black fruits, spice and some medicinal aromas. A smooth feel in the mouth balanced with fine grained tannins and both fruit and savoury flavours. When I tasted this wine I was reminded of biting into a dark plum when you have the tang of the tart skin followed by the flavours in the flesh of the fruit. The finish of this wine was of minerals and spice with a persistent heat from the alcohol in the wine (14.5%). Aromas of gooseberry, Meyer lemon pith, a hint of passion fruit. Medium body and acidity with flavours of lemon and grapefruit followed by gooseberry and cut grass in a medium finish. Aromas of sweet and fresh lemon and grapefruit, butter and the softest hint of toffee. Medium body and acidity with flavours of lemon curd, burnt butter and fresh grapefruit. Medium plus finish. Aromas of black pepper, earth, wet leaves, blackcurrant leaf and black plum. Medium body and acidity, medium fine grained tannins with flavours of black and red plums, black cherry, black pepper and a hint of sweet vanilla. A medium plus spicy finish. Aromas of blackcurrants, black plums and vanilla. Medium body – a clean and elegant mouthfeel and structure, medium acidity with medium plus fine grained tannins. Flavours of blackcurrant, black and red plums and black pepper. Medium plus finish. Aromas of black fruits, menthol, licquorice, blackberry pastilles and red plums. Medium body with a smooth mouthfeel, medium plus acidity and medium plus fine grained tannins. Flavours of blackberry, black plum, blackcurrants, sour cherries and wet stone. A medium plus finish of tea leaves and slate or pencil shavings. Some residual heat from the high alcohol. Bird, D. (2010). Understanding Wine Technology. The Science of Wine Explained. San Francisco: The Wine Appreciation Guild. 1. Bird, D. (2010). Understanding Wine Technology. The Science of Wine Explained. San Francisco: The Wine Appreciation Guild. 2.Johnson, H. & Robinson, J. (2007). The World Atlas of Wine. Great Britain: Mitchell Beazley. 3.”Coulure is the result of poor flowering conditions and/or an imbalance of the nutrients in the vine. These result in poor or imperfect pollination and often quite substantial crop loss.” Skelton, S. (2007). Viticulture. An introduction to commercial grape growing for wine production. Great Britain: Stephen Skelton page 123. 4. Robinson, J. (2006). The Oxford Companion to Wine. Great Britain: Oxford University Press. Donde puedo comprar sus vinos en Miami, Florida.